A version of this article, as it originally appeared in the New Haven Independent on April 1, 2015, can be viewed here. Third and final in a series exploring where the Greater New Haven Region is now, how it got to where it is, and how it might imagine itself in the future; covering the author’s conceptual plan for transforming the current codependent city-region into a Garden Region. While social justice movements have attempted to advance causes for equality, social disparity in law enforcement, judicial sentencing, economic opportunity, and academic performance remains rampant. I believe this inequity may persist despite recent legal progress because of the inability to address an underlying issue of modern society – the geographic segregation of residents by race and income or the regional spatial hierarchy. Inequality in the modern city and region has been formed by the development of single-use, homogeneous places that encourage the mass, habitual divestment from old neighborhoods in favor of new ones as the primary way of achieving upward mobility. The story of upward mobility in the modern city and region has often been told as an inspiring tale of hardworking families leaving the old neighborhood and moving to a new community further from the city center where a higher standard of living can be enjoyed. This story, while inspiring for individuals, has been devastating for neighborhoods because it has meant the planned and accepted obsolescence of the old in favor of the new. In Greater New Haven, the center city has inherited the oldest and least desirable neighborhoods, while the wealthiest communities primarily exist beyond the central municipality. In this scenario, what is often the best, most responsible decision for one’s family – to move to a more homogeneous neighborhood outside the city where schools, safety, and health are seen as improving – ends up resulting in a tremendous loss for the place left behind. This phenomenon repeated in mass by large segments of the population over decades has an enormous impact on the image, perception, and livelihood of entire neighborhoods. Astonishingly, it often seems that doing what is best for one’s family can be harmful to the surrounding region as a whole. I dream of the day when the conditions exist insofar that doing what’s best for one’s family and one’s regional community are one and the same. I imagine these conditions as a region full of neighborhoods where public safety, academic rigor, and good health can be found along side housing affordability, adequate jobs, and social diversity. This article is an exploration into how these conditions might manifest in Greater New Haven. As previously discussed in Where We Are, the 12 Inner and Outer Ring Suburbs surrounding New Haven are losing more jobs and population in the 25-44 year old demographic than the City is able to create and attract. The young adult population is vital to stimulating economic growth and funding the social programs of the future. Furthermore, the population of retiring and aging residents is concentrated in sprawling, exurban areas where services and social opportunities are not easily accessed without a car – possibly creating places without a future for the nine Outer Ring Suburbs. This demographic above the age of 64 is needed where they can impart their wisdom to the next generation. Additionally, the three Inner Ring Suburbs and the eight Medium Income Areas of New Haven have sustained skyrocketing poverty rates as families wanting upward mobility are moving into these largely suburban neighborhoods that tend to lack immediate access to services, employment, and opportunity. In the years to come, neighborhoods such as Highwood and the Plains in Hamden, Amity, Quinnipiac Meadows, and the Annex in New Haven, and the Centers of East Haven and West Haven may become more like New Haven’s Low Income Areas, which have been in dire straits since the collapse of the city’s industries 30 years ago. Finally, New Haven may be unable to retain young adults as they age if the cost of living is not lowered and safe neighborhoods for every child may not be achievable without sharing the responsibility of providing the region’s social services between all 13 towns. Forecasting these trends to their logical conclusion – should nothing be done – results in a bleak picture for the future of Greater New Haven. Imagine dwindling economic opportunity outside of New Haven, leading to increased competition for jobs in a city that already suffers from high unemployment. Envision budget crises in suburban towns as they try to fund services for their radically changing demographics. Picture a handful of vibrant neighborhoods completely out of reach for working class individuals and families. That is not the kind of region for which we should strive. If these events unfold, the argument for regionalizing Greater New Haven will grow stronger. After all, consolidating services, property taxes, and pension funds could provide some cost savings and additional revenue for the region. Likewise, the Greater New Haven Community Index 2013 provides ample material to use in applying for social services grants, lobbying for additional social programs, and funding existing programs of the kind that have been aimed at mitigating the impacts of concentrated poverty, chronic unemployment, and violence for the last 60 years. In the near future, we may also see a tax levied on the income-producing activities of non-profit organizations such as student housing, investment income, and certain bio-medical research. Revenue generated from taxing institutions like Yale University and Yale-New Haven Hospital might make up for shortfalls in the State’s PILOT program, which partially reimburses municipalities for tax-exempt properties. Poverty, chronic unemployment, and violence will not be solved by merely raising additional revenue through consolidating regional administration and tax-exemption reform to support social services. Furthermore, there is no guarantee that initiatives directed solely at uplifting individuals through wage increases and local hiring will do anything to address the spatial hierarchy of the region – wealth will likely continue to migrate away from older neighborhoods. Therefore, the task ahead requires the region to develop in a way that encourages socially integrated, continually renewed, and easily accessible neighborhoods and towns. Initiated at the turn of the 20th century by Sir Ebenezer Howard in order to address the compounding problems of congestion, pollution and unplanned growth in the industrial city, the Garden City Movement is modeled on the idea that new urban growth should be limited in size, surrounded by greenbelts, and built with proportionate amounts of housing and employment in order to remain self-sufficient. This planning tradition, which has been carried forward by the New Urbanism, may offer insight for developing Greater New Haven in a more equitable way. 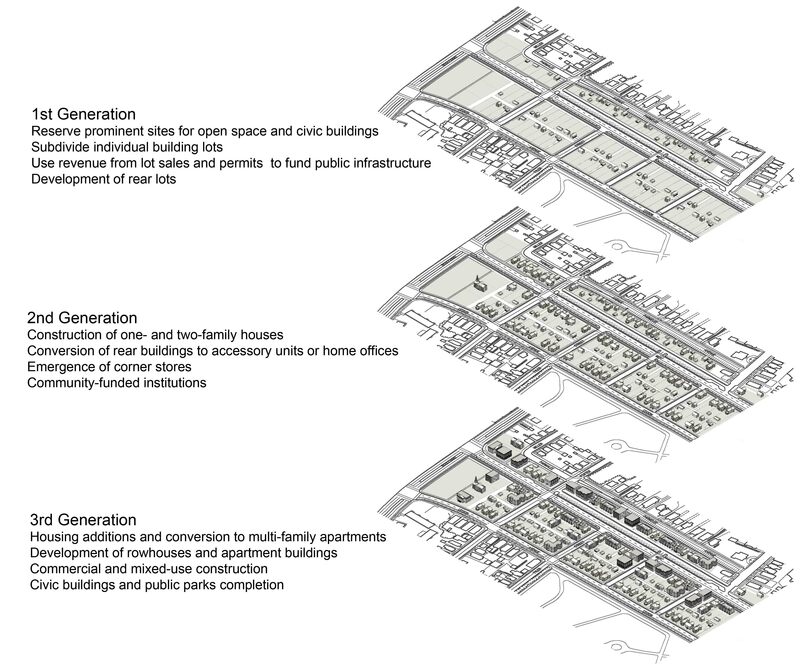 The Garden Neighborhood proposes the self-sustaining idea of the Garden City at the scale of the neighborhood. Ideally, each Garden Neighborhood has proportionate employment, housing, shopping, recreation and civic infrastructure for it to be economically and socially self-contained. That is not to say that daily activities must be confined to the neighborhood, only that it should be possible to access one’s daily needs within walking distance of home. Individually, each neighborhood should provide a range of job options, a variety of housing types at various prices, a mix of shopping destinations, access to services, and other neighborhood-specific facilities such as schools and parks. Collectively, a network of Garden Neighborhoods should form a highly navigable and seamless urban fabric. Similar to the Garden Neighborhood in most ways, the Garden Town differs only in its separation from the city. Rather than being part of a contiguous urban fabric, Garden Towns are surrounded by greenbelts and accessed by transit. And when a series of Garden Towns is assembled around a city of Garden Neighborhoods, they form a Garden Region. 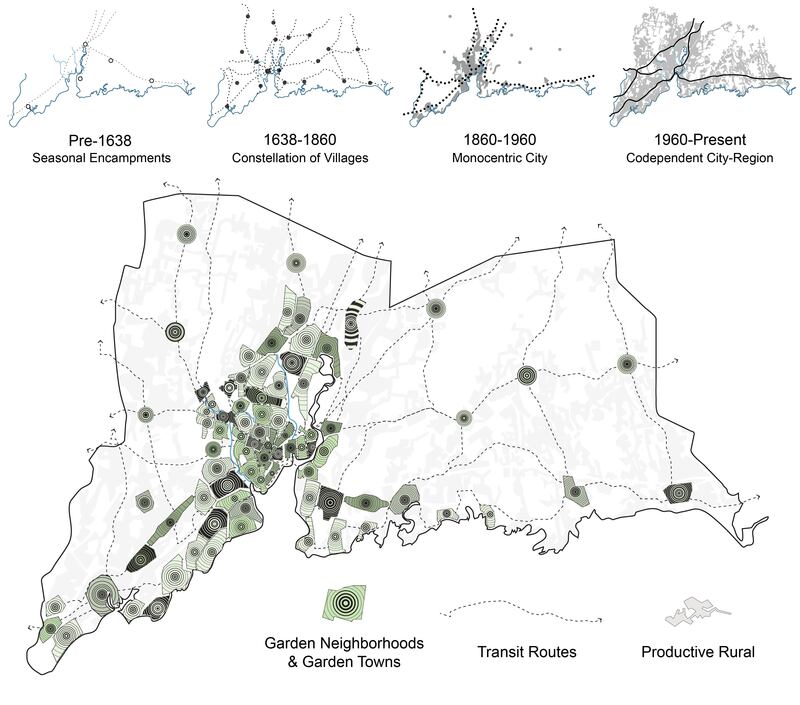 Greater New Haven re-imagined as a Garden Region would be a substantially more equitable and sustainable place to live compared to today’s inaccessible, segregated, and exclusive codependent city-region where commercial centers are far from residents’ homes, economic opportunities are restricted to those without easy access to a car, and the poor live in pockets of concentrated poverty in a handful of city neighborhoods. By using the Garden Neighborhood as the model for Downtown, urban villages, urban neighborhoods, and suburban neighborhoods, New Haven’s existing neighborhoods can become more self-supporting and desirable places. 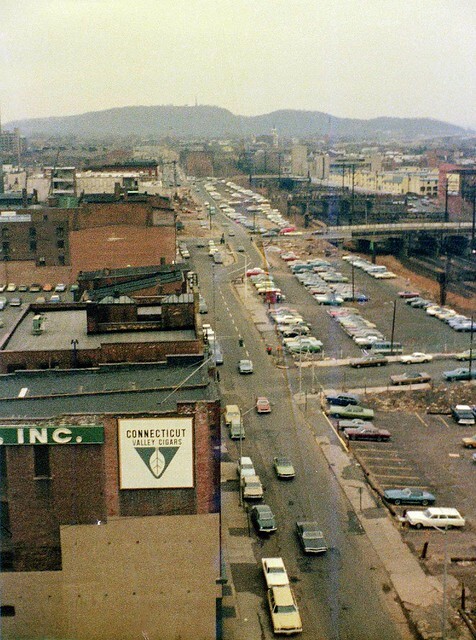 In the 20th Century, Downtown New Haven became overwhelmingly commercial in character – populated by commuters, high-rise office buildings, and parking structures. As highway construction made inexpensive exurban land attractive to develop, however, vacancy in many of the city’s commercial buildings rose. Fortunately, rising demand for rental housing, the rejuvenation of retail, and a growing food services industry have provided an opportunity to develop the center of the city into a more proportionate Garden Neighborhood. With around 20,000 jobs and only 11,000 residents, there is a significant housing shortage Downtown. Projects like the Ninth Square District, The Taft, The Eli, and The Union exemplify how to re-use obsolete commercial buildings. Alternatively, 360 State and CenterPlan’s College Street building demonstrate the demand for large scale new residential construction. The conversion of Brown & Von Beren’s Crown Street Garage into apartments shows a possible future for underused parking garages in the city. These developments help to provide alternatives to commuting, encourage 24-7 activity and occupancy Downtown, stabilize the retail market, use parking more efficiently, and bring higher-income households into a Medium Income Area of the city. The continued development of these types of projects, however, will only add to Downtown’s supply of single occupancy households located in small apartment flats, which represents the overwhelming majority of its housing stock. Missing from this recent residential rejuvenation is market rate housing for middle and upper income families. The New York Apartment House may offer an existing model for the development of desirable high-density multi-family housing that could be effectively adapted for the New Haven market. The renewal and revitalization of Church Street South Housing could have also preserved large, multi-family units near the center of the city. While many affordable units in that complex could be preserved, in general, affordable housing is well represented Downtown with McQueeney Towers, Crawford Manor, and the Residences at Ninth Square, but that may change in coming years as thousands of new higher-end units come into the market. Aside from housing, the recent addition of a high school and community college has further diversified the population Downtown. 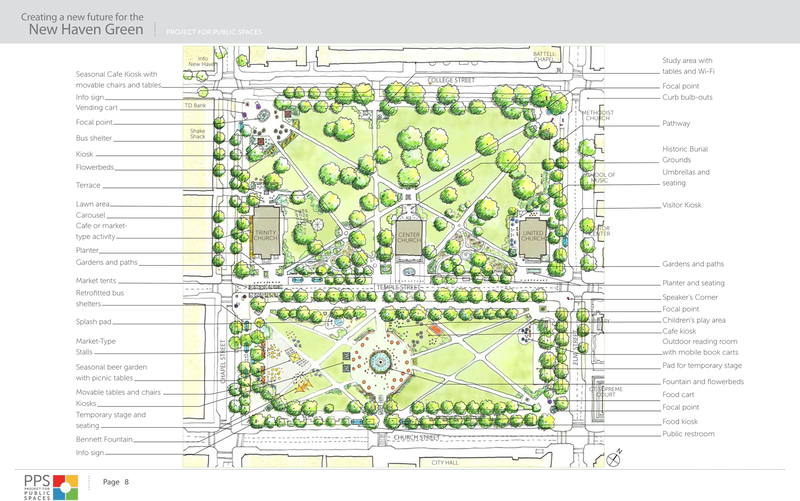 A plan to enliven the Green, similar to what was proposed by the Project for Public Spaces in 2012, could bolster all the future Downtown development. The city’s recent exploration of converting Downtown’s streets back to two-way offers hope for creating a sensible framework that is conducive to a Garden Neighborhood in the center of the city. Having developed a dense, mixed-use, and walkable character prior to being engulfed by industrial-era suburban growth, the West Village, Orange Street, Wooster Square, the Westville Village, Fair Haven Village, and the town centers of West Haven and East Haven need only to reinforce and enhance their existing character through a combination of historic preservation and sensitive infill. Retaining the intimate scale and vibrant mix of uses of these urban villages can be accomplished through preservation work, which is best achieved by encouraging individual property owners to make improvements, rather than large-scale government-coordinated redevelopment. While it is often prohibitively expensive to match the quality of older buildings with new construction, a number of recent moderate-density projects offer practical models appropriate for village contexts. For instance, Arts Lofts West and Friendship Houses integrate medium density, mixed-use and mixed-income developments into the Westville Village and Wooster Square. 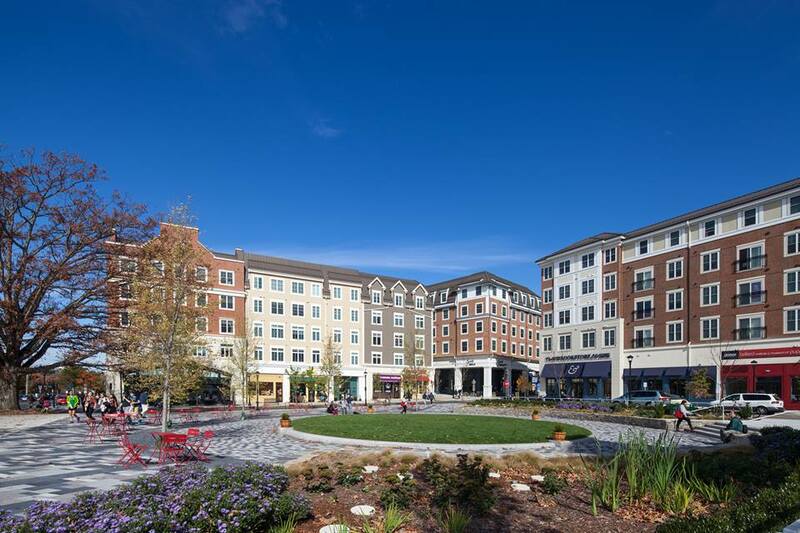 Likewise, Turnbridge Crossing delicately incorporates condominiums, offices, and a restaurant into the tightly-knit Quinnipiac River Village. Fair Haven Mutual Housing has developed several sites in recent years, including a highly contextual mixed-use building on Grand Avenue. Two developments in the Arts District – Audubon Court and Whitney Grove Square – epitomize appropriately scaled, mixed-use new construction for New Haven’s urban villages. 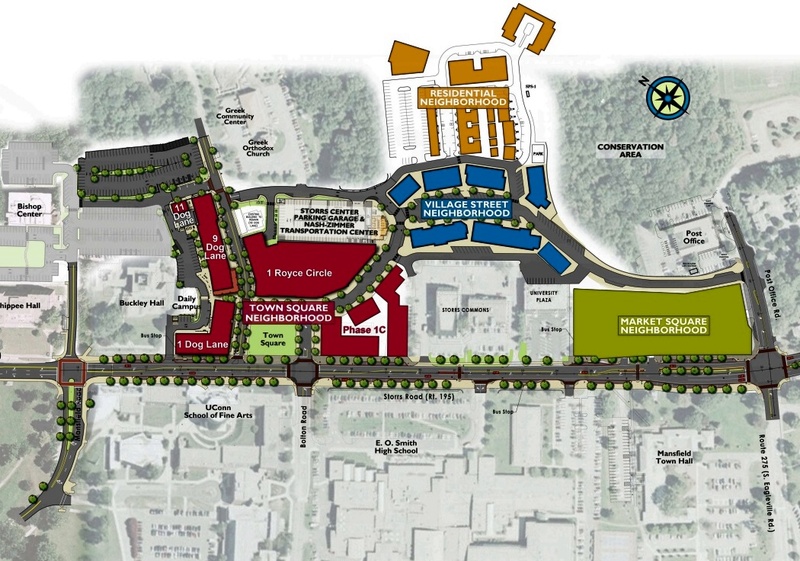 Both of these developments include condominium townhouses, apartment flats, office space, retail, and hidden parking. Several recent housing proposals for the Olive Triangle, Wooster Square, and Chapel West, while interesting projects with a mix of units types, could have benefited from studying the office component, scale, and form of the two Arts Districts developments. Aside from residential construction, there have also been a number of efforts made in these neighborhoods to promote business and community development. Across the street from Audubon Court is the Foundry building, a former industrial complex since converted to retail and office space. Several factory buildings on Fitch and Blake Streets in Westville have also been adapted for commercial use. And in Fair Haven a group is attempting create apartments and a community arts center in the former Strong School building, having been vacated as a result of the New Haven Citywide School Reconstruction Program. Some neighborhoods like lower Westville and Whitney-Orange have managed to avoid the degenerative process of the region’s spatial hierarchy, while others like Edgewood, Chatham Square, Dixwell, and Goatville have begun a renewal having previously gone through a period of decline. It’s within these urban neighborhoods that we may find strategies to rejuvenate the working class neighborhoods of Newhallville, the Upper Hill, and Blatchley Avenue. First and foremost, struggling working class neighborhoods demand economic and social anchors. Many of these neighborhoods contain a range of vacant industrial properties that once acted as employment centers for residents and could be re-purposed for commercial, residential and community use. The former AC Gilbert Company factory on Fair Haven’s Peck Street has been reborn as an arts, research and business center; a former industrial district in West Haven is being planned around a new train station as a transit-oriented development; and the Marlin Business Center at 85 Willow Street has become a successful office building. Science Park began as a joint venture between Yale, the City, and the Olin Corporation in the early 1980s to redevelop the Winchester Repeating Arms Company campus and has slowly grown into a small business incubator for companies like Alexion Pharmaceuticals and Higher One. Having not delivered on many of the intended benefits, one wonders if Science Park would have been better left to develop organically like the examples above. Neighborhood Housing Services of New Haven has been revealing the underlying beauty of the most distressed housing stock in the Hill, Newhallville, Edgewood, and West River for decades through preservation work and counseling for low-income homeowners. Similarly, the rediscovery of former mansions on Sherman Avenue, Ferry Street, Dixwell Avenue, Chapel Street, and Howard Avenue could lead to the reintegration of higher-income households into city neighborhoods (see recent rehabilitation work along Prospect Street, NHS’s Chapel Street project, or Brown and Von Beren’s Three Sisters in the Hill). Additionally, a number of Federal and State Tax Credit Programs encourage the rehabilitation of historic factory buildings, enabling projects like Winchester Lofts to not only re-purpose vacant structures, but also attract high-income households to Newhallville. The Beulah Land Development Corporation has developed new housing in working class neighborhoods. Shipping container housing offers a quick way for small, private developers to provide affordable and desirable housing. The Yale Building Project has been constructing new houses on vacant lots throughout these neighborhoods for decades, helping to repopulate neighborhoods ravaged by deindustrialization. In 2011, the Building Project produced a two-family house that could be converted into a single-family house with the removal of a single wall panel. Of particular interest is a recent project from 2014 on Scranton Street in West River, which built a small house in the rear of the lot. This project provides space for the future addition of another building in the front lot, allowing the original building to become an accessory unit. This template for could be replicated on vacant lots throughout the city. 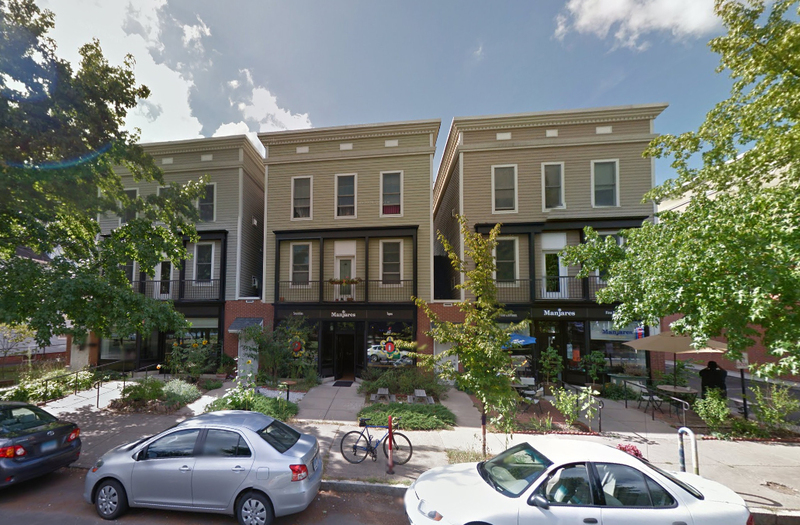 Laurie Pirie, AIA has also designed urban infill housing in the Putnam Street area of the Hill. Many suburban neighborhoods have barely changed since first being developed. In most cases, they’ve remained overwhelmingly single-family residential in use and separated from commercial areas – producing dormitory communities where employment is found outside the neighborhood. 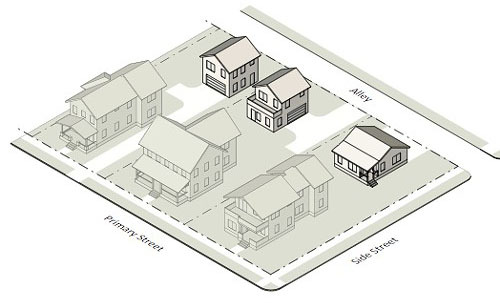 While varying in density and block length, New Haven’s suburban neighborhoods typically have compact street networks that could accommodate denser development and the integration of commercial uses characteristic of Garden Neighborhoods. By adapting some of the existing building stock to different uses just as urban neighborhoods have done, suburban neighborhoods could intensify through greater diversity and density without changing the domestic character of neighborhoods. The conversion of Trumbull Street from an upper class residential enclave to a professional office district serves as an example of how to promote business growth on prominent through-streets in residential neighborhoods. In rear lots, underused garages can be turned into home offices, workshops, and accessory units for use as income-producing rental apartments, transitional housing for young adult children, or an affordable alternative to a retirement community for an aging relative. Enabled by telecommuting, home offices may become a powerful tool for addressing the two-income trap by allowing one parent to stay at home with children. 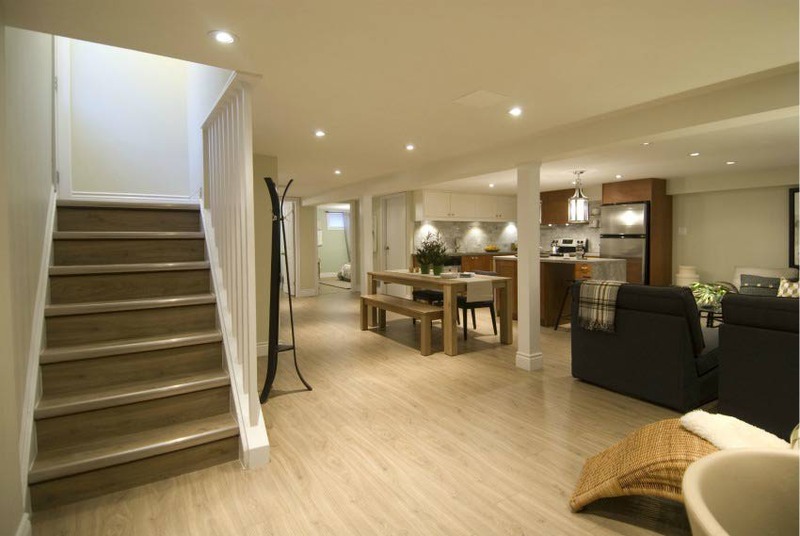 Likewise, large houses may be ideal for basement apartments and first floor small businesses or markets. Assuming the design is sensitive, new construction can also be effective in integrating new uses into an existing residential neighborhood. Multi-family houses, for instance, can be made to look like single-family houses and small offices can be hidden within the fabric of residential streets. 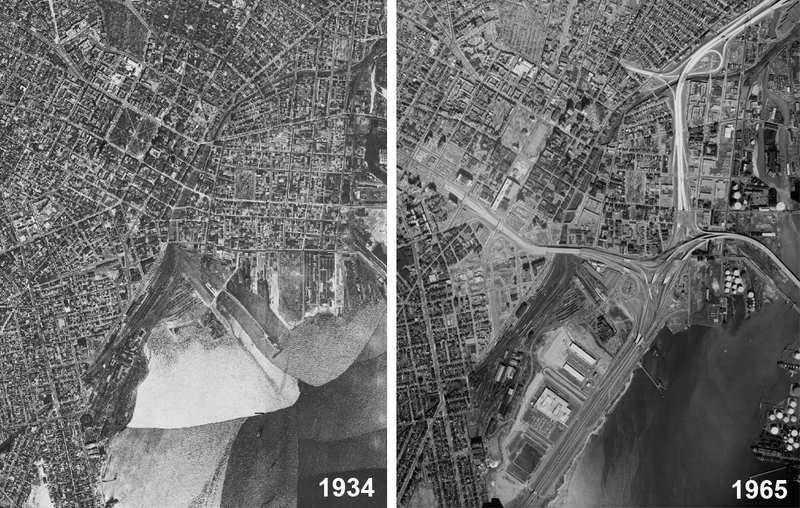 The construction of the Interstate Highway system through Greater New Haven irreparably changed the region in the second half of the 20th century. Within the city, Federal and State highway funds, and urban redevelopment dollars were used to clear neighborhoods and replace them with expressways, housing complexes, and single-use districts oriented around automotive travel. Outside the city, the Interstate Highway System opened up former farmland for the development of exclusive housing subdivisions, industrial parks, and commercial centers. Places like the Milford Mall, the Boston Post Road, the Hamden Shopping Plaza, Universal Drive, and Foxon Boulevard owe their rapid development to highway construction. Unlike the surgical interventions applied to New Haven’s urban and suburban neighborhoods, these sprawling single-use areas require fundamental changes to their form, scale, and character. Sprawl Repair essentially consists of two strategies. The first is transforming limited-access expressways and arterial roads into multimodal boulevards and avenues. The second is redeveloping parking lots adjacent to these roadways into street networks lined by mixed-use, multistory buildings. Within the city, the aim is to reestablish a continuous urban fabric where gaps, resulting from urban redevelopment projects, currently exist. Outside the city, these strategies are aimed at transforming commercial plazas into true regional centers where people not only shop and work but also live and socialize. 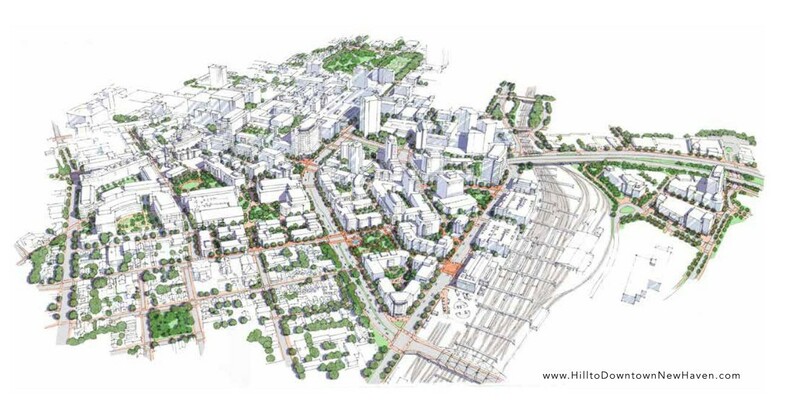 The Hill-to-Downtown Community Plan offers one approach to redeveloping the medical district and Church Street South. A departure from the planning of single-use districts, the Community Plan calls for the development of housing and retail in addition to biomedical-related buildings in the area around Amistad Park. Included in the plan is a redesign of Church Street South Housing to become a mixed-income and mixed-use neighborhood organized around a public park leading to the train station. The City’s 2008 Future Framework Plan even calls for a mixed-use residential neighborhood in the heart of the Long Wharf Industrial Park. Two other planning districts in the city, Downtown Crossing and the Mill River Plan, however, lack the residential uses that are helpful in the creation of active places. Downtown Crossing, the plan to replace the Oak Street Connector with boulevards and development parcels, is more accurately described as an expansion of the office park created during urban renewal. That’s because the existing public right-of-way is being replaced with private service roads while the current carrying capacity of the highway is being transferred on to surface streets – not removed like other highway removal projects in San Francisco, Syracuse, and elsewhere. Moreover, the new buildings are envisioned as commercial developments each with their own attached parking structure – typologically identical to the urban redevelopment era office buildings. Continued residential construction in Downtown New Haven, however, may compliment the commercial development around the Oak Street Connector. Narrow lots on the east side of State Street resulting from a 1970s road widening project offer an opportunity for creative infill projects. Single-use centers outside the city near highways and along arterial roadways beckon similar interventions of mixed-use development and roadway redesign. Shopping malls and big box strip developments have expiration dates as newer centers in adjacent towns replace them and retail in older town centers rejuvenates. Strategies developed by New Urbanist planners propose that distressed shopping centers and big box strip malls can be redeveloped into mixed-use regional centers that include retail, housing, office, recreational and civic space organized in a traditional town pattern. 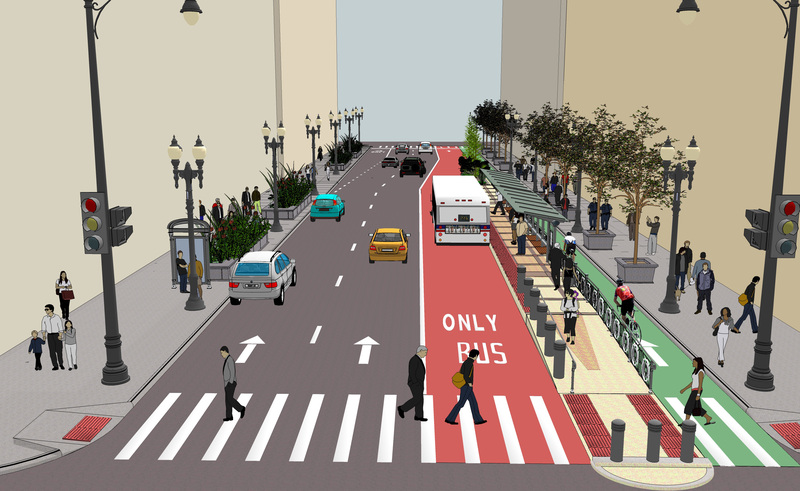 Simultaneously, large arterial roadways can be converted to multimodal avenues by reducing lane widths, converting some lanes to bus-only, adding sidewalks with bus shelters, and creating bike lanes. In its recent Plan for Conservation and Development, the Town of Orange has proposed many of these design elements for sections of the Boston Post Road, which could serve as an example for other towns with similar infrastructure. Since shopping plazas and office parks lack housing of any kind and the towns that contain these commercial centers tend to lack affordable housing, mixed-income residential developments may serve to spur sprawl repair efforts while providing housing accommodations. Thanks to the Hope VI program and its successor, Choice Neighborhoods, New Haven’s rebuilt public housing complexes like Monterey Place, Quinnipiac Terrace, Eastview Terrace, Brookside, and Rockview provide a model for developing mixed-income housing adjacent to exurban commercial centers. Unlike New Haven’s suburban neighborhoods, however, exurban residential sprawl development located beyond the contiguous fabric of the city doesn’t lend itself to the effective integration of non-residential uses. Due to the extremely low-density of street intersections in these outlying areas, they would require severe interventions to extend and connect streets, construct new streets, and accommodate greater density – all strategies that are neither financially practical nor politically possible. Therefore, exurban sprawl located outside of the regional commercial centers may seek to reform themselves in a different way. While much of the farmland around the periphery of the city has been subdivided and developed for residential, commercial, governmental, and recreational uses, some remains is use and some new farmland has been created. This productive agricultural land provides an alternative to high-density, mixed used development for creating a sustainable landscape. Qualities that are disadvantages to creating high-intensity urban spaces such as large lot sizes and small buildings setback far from the street become advantages for food production. Land currently used merely as yards and driveways provides ample space for gardens, greenhouses, syrup and honey evaporators, chicken coops, grazing fields, and other productive uses that can transform exurban sprawl into sustainable places to live. Where urban living minimizes one’s carbon footprint through density, productive use of large house-lots in low-density areas mitigate one’s footprint through better use of the land. Rather than controlling cosmetic concerns, existing Homeowner’s Associations could be retooled and new associations could be formed in order to administer food production. Members might pay an annual fee that funds staff to tend gardens and produce food on members’ properties then receive a portion of the seasonal crop yield. Or members could contribute to a local market on their own to satisfy their membership requirements, or any number of variations through an association. Counseling programs now exist for small-scale farm workers. 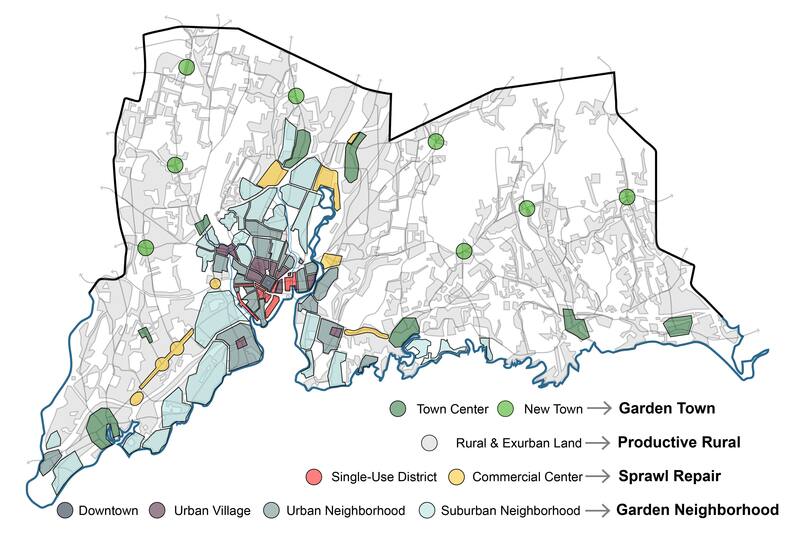 Just as the Garden Neighborhood can inform the development of New Haven’s neighborhoods, surrounding town centers can emulate the Garden Town model in order to form a cohesive Garden Region. 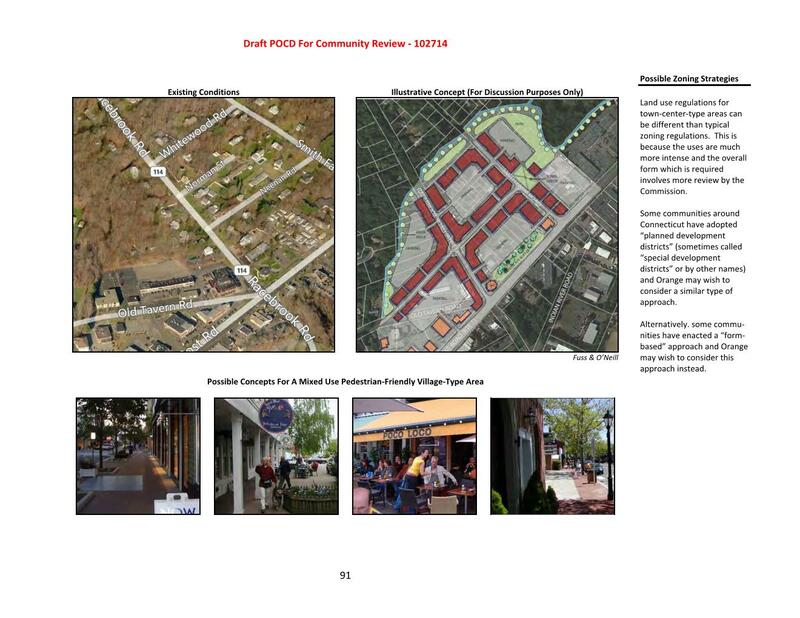 The existing character of the town centers of Madison, Guilford, Branford, North Haven, Hamden, Woodbridge, Orange, and Milford should be reinforced with preservation and propagated through in-kind expansion, similar to the strategies outlined in the Urban Villages section. Additionally, a new proposal for the expansion of the Branford Town Center offers a way for towns to grow their local centers. A more delicate approach is offered by the Yale Urban Design Workshop’s concept plan for Woodbridge’s Amity Flats section, which may be relevant for small town centers in Orange and Bethany. Lastly, should all the development opportunities previously described not absorb all the demand for new growth in the future, an additional strategy exists. 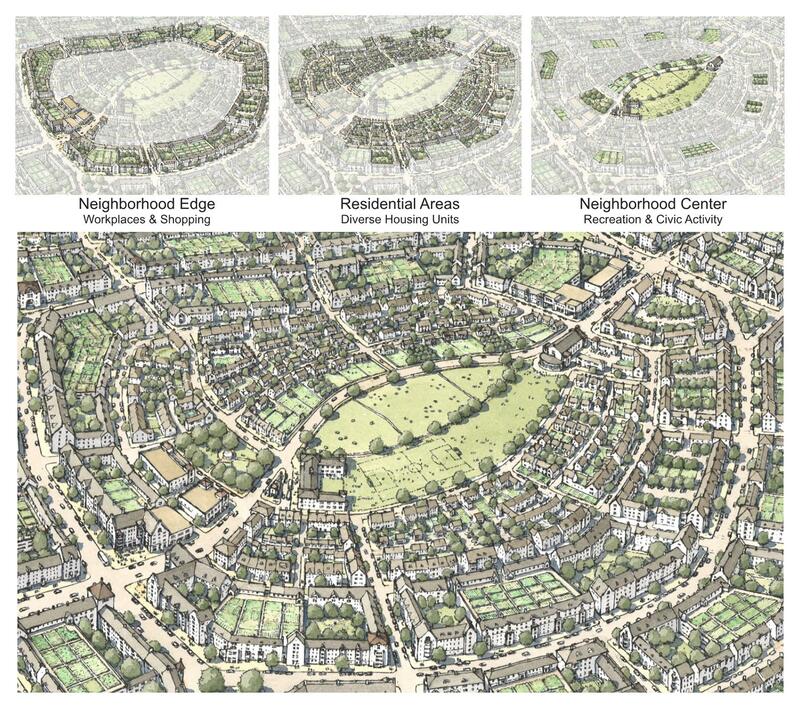 Just as the Garden Town may be used as a model to which existing town centers aspire, it might also inform the design of new towns. Placing these new Garden Towns along transit routes and at important intersections is the most advantageous. For instance, a series of new towns could grow along the Old Toll Road (Route 80) in North Branford, North Guilford, and North Madison. To the west, Woodbridge and Bethany might welcome new towns along Route 63 (Amity Road) and where Ansonia Road meets Racebrook Road. Flanked by two Quinnipiac University Campuses along Whitney Avenue, Hamden’s Mount Carmel could be a candidate for a development like the recently completed Storrs Center on UConn’s main campus (see below). In accordance with an expansion of commercial and residential development in these town centers, inclusion of social services is also warranted. Perhaps Towns surrounding New Haven should provide for a small number of spots in proportion with their town’s overall population for social services in order to lessen the burden on the central city, which currently provides virtually all of the region’s social services. A corner café on your block, a professional office down the street, or the opportunity to bike to new stores and housing on the Boston Post Road might sound like wonderful ideas, but they will remain mere ideas so long as these types of developments are prohibited under existing zoning ordinances. Affordable housing outside the city, commercial development in traditionally residential neighborhoods, and reduced parking in the urban core are similarly impractical without significant changes to the region’s transportation system. And just because something is allowed and practical doesn’t necessarily mean people will want to do it. There are several roadblocks in the path to reform. Municipal zoning ordinances emerged in the early 20th century partially from an attempt to mitigate the noxious impact of industrial production on residential areas by regulating land-use, resulting in the division of cities and towns into functional residential, business, and industrial zones. Contemporary zoning ordinances are similarly tasked with protecting residential areas by preventing change and promoting business development through the functional separation of commercial uses. This approach to regulating land-use could not be more wrong because it relies on understanding cities and towns as instruments of industrial production and series of competing functions rather than a network of self-contained neighborhoods and town centers interdependently working to form a thriving region. Furthermore, in the last century, environmental legislation and de-industrialization have addressed some of the issues for which zoning was created. In light of zoning’s obsolescence and perverted understanding of cities and towns, a different application for land-use regulation may be justified. Are cities instruments of industrial production? Are they a series of spatial experiences formed by the presence or absence of defined-spaces? Are they trading floors for speculative investments? Are they forums for individual expression and self-determination? If cities are instruments of industrial production and exclusion, then Euclidean, use-based zoning makes sense. If cities are purely experiential, then form-based zoning codes make sense. If cities are places for investment, then land use policies that encourage building obsolescence and redevelopment may achieve those ends. If, however, cities are forums for action by their inhabitants, then zoning should empower and encourage individual property owners to invest in their properties to accommodate their changing household needs and market opportunities. This type of zoning may provide broad, but not unlimited, freedom to owner-occupied properties for the creation of new uses and spaces within the property through accessory use and structure provisions. Absentee investments, on the other hand, might be restricted. Would residential neighborhoods be more open to rental apartments and storefronts if they were being provided by their neighbors rather than an absentee investor? First and foremost, the Garden Region plan for Greater New Haven calls for a refocus on the neighborhood as a principal unit for living, working, shopping, and assembling. Inherent in this focus is the need for a reprioritization of transportation planning in the region. 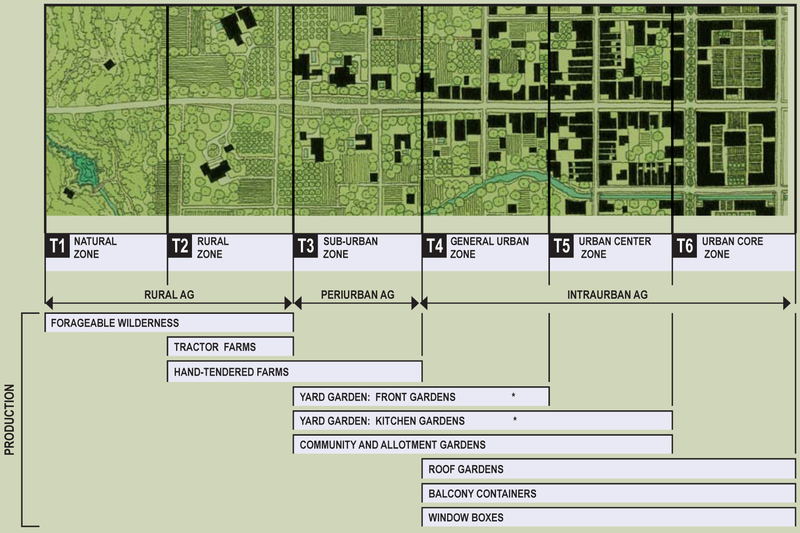 A Garden Region is a place that prioritizes local, human-scale and collective forms of transportation over regional, mechanized and individualized forms of transportation. This is elemental for creating towns and neighborhoods where daily life revolves around walking and biking, cities where weekly and monthly needs are a short transit ride away, and regions where driving is convenient so long as most people only have to do so occasionally. Transit is a vital form of transportation for which to plan because it connects destinations that are beyond walking distance from one another and provides an alternative to driving, which is particularly advantageous for young, aging, and other groups with limited income and car access. One problem with the current transit system in Greater New Haven is that the bus routes retain the monocentric industrial city’s hub-and-spoke system despite radical changes to the region’s organization in the last 50 years. 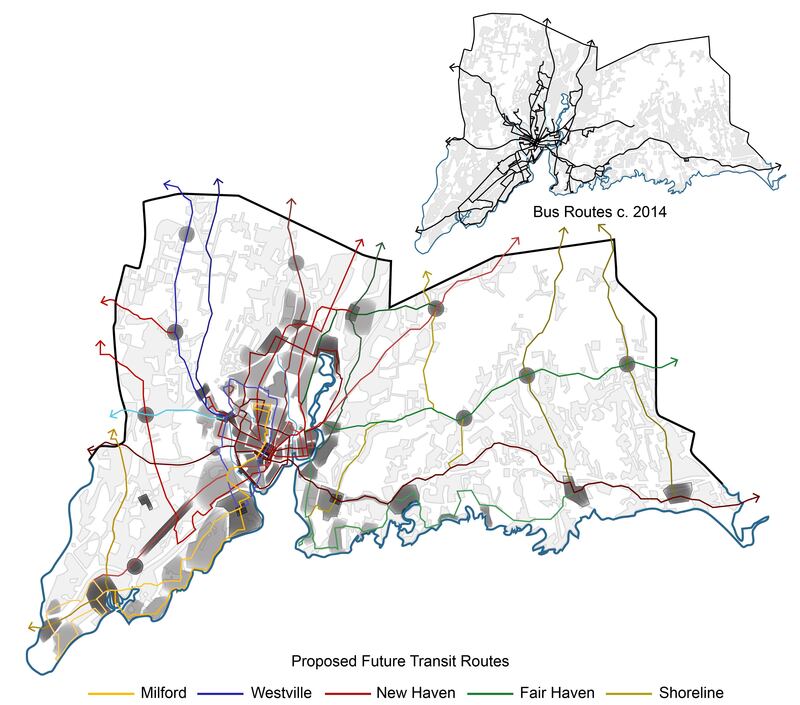 A transit system to accompany the Garden Region plan for Greater New Haven might 1) maintain a hub-and-spoke system to service the central city; 2) consolidate parallel routes; 3) add circumferential routes around the periphery of the central city; and 4) create secondary transfer stations in Milford, Westville, Fair Haven, and the Shoreline. Aside from eliminating the need to transfer at the New Haven Green for many trips and consolidating redundant lines in New Haven, this transit framework attempts to expand service to new and existing town centers – thereby making possible the location of affordable housing and social services in those places. For a description in greater detail see here. Making the development of mixed-use, mixed-income neighborhoods legal through land-use regulation reform and functional with transportation redesign may not be enough to entice people to act. For this reason, incentives become a useful tool. Anytime a municipality makes a Land Disposition Agreement (LDA) with an organization there is an opportunity for a Community Benefits Agreement (CBA), which is a tool that disenfranchised groups can use to extract conditions from developers when other land-use regulations are lacking. The City of New Haven has made several land deals in recent years, including 360 State Street, 580 Dixwell Avenue, and Route 34 West, in which certain conditions were agreed to by a developer in exchange for city-owned land. In future LDAs with CBAs, it would be beneficial to seek provisions that encourage employers to establish transportation plans and homebuyers programs for employees. Yale University, Yale-New Haven Hospital, Connecticut Housing Finance Authority, and the City of New Haven offer programs to first-time homebuyers that could serve as models for employers. In the event that incentives are not enough to initiate these reforms across the entire region, a mandatory legal requirement may become necessary. Just as the 1996 Connecticut Supreme Court case Sheff v. O’Neill resulted in a requirement to racially-desegregate public schools State-wide, a similar lawsuit focused on income- and housing-segregation as propagated by the regional spatial hierarchy could provide the necessary impetus for region-wide compliance with a Garden Region Plan. While courts can’t require that people live and work in the same neighborhood, a legal ruling could conceivably require that towns not only acknowledge the benefits of such an arrangement, but also provide for the ability to do so through specific regulatory provisions and incentives programs. Connecticut State Statute 8-30g, for example, relaxes municipal zoning requirements for the development of affordable housing in towns where less than 10% of the overall housing stock is affordable. Documents like the Greater New Haven Community Index 2013 supply metrics, such as housing affordability and income, which can inform the proper balance of development required to achieve regionally proportionate neighborhoods and towns. For instance, these guidelines might recommend that all new multifamily housing construction have 11% affordable, 27% workforce, and 62% market rate units. In general, however, new development should be encouraged to address existing deficiencies in neighborhoods, whether they are commercial, civic, or housing-related. Coordinating a redevelopment project of this scale would be nearly impossible given today’s arbitrary colonial-era municipal boundaries and lack of County Governments, which were abolished in Connecticut in 1960 – much to the retrospective chagrin of former New Haven Mayor, Richard C. Lee and others. 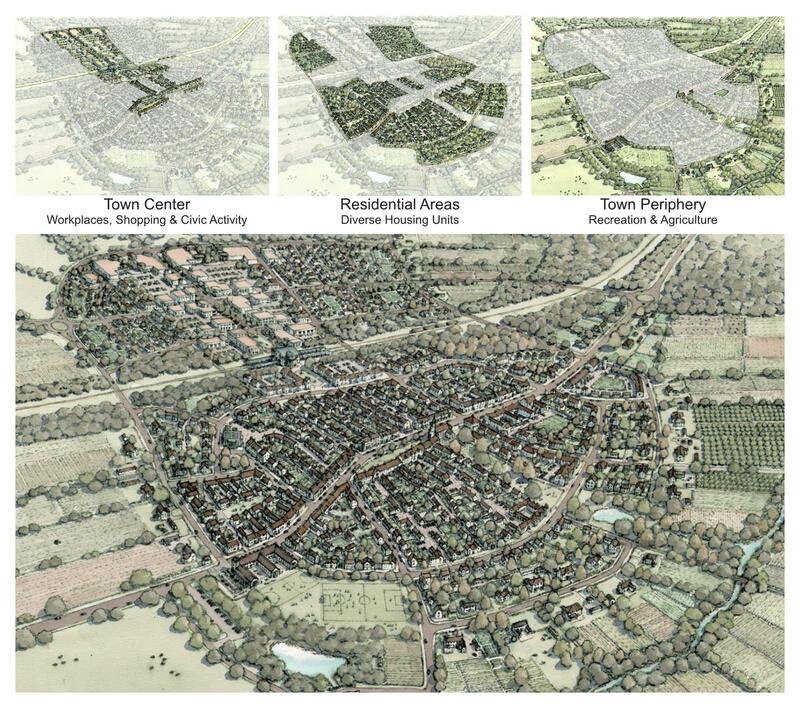 Ideally, town lines would be drawn based on geographic, geologic, topographic, and economic factors. 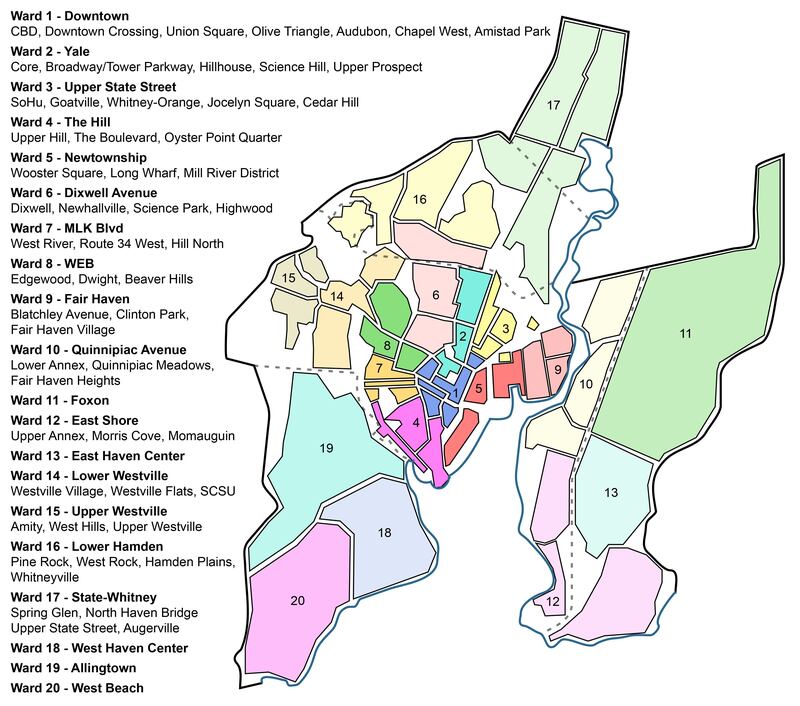 The City of New Haven might incorporate the contiguous suburbs of East Haven, West Haven, and lower Hamden into the ward system through annexation and consolidation, similar to what was done with Westville, Fair Haven, and the east shore of the Quinnipiac River between 1870 and 1921. Outside the city, comparable towns like Orange, Woodbridge, and Bethany in Amity or Branford, Guilford, and Madison along the shoreline might consolidate into single municipalities. Alternately, if new towns are successfully implemented in these places, North Guilford, North Madison, and Northford might instead separate from their host towns. Creating places where principals, teachers, and janitors can all find housing; children and the elderly can independently travel to stores and services; and community bonds are fostered at neighborhood institutions is beneficial socially, economically, and for public health and safety. The intended outcome of reorganizing Greater New Haven into a Garden Region is to turn existing neighborhoods, town centers, and commercial sprawl into desirable, inclusive, and accessible places to live, work, shop, and gather. This effort may be aided by allowing, encouraging and, perhaps requiring towns to implement strategies aimed at 1) housing a cross-section of the region’s population, 2) integrating proportionate commercial, recreational and civic spaces, and 3) connecting neighborhoods with a multimodal transportation network. In such a region, the primary tool for upward mobility would no longer be to abandon the old, but rather the constant rejuvenation of existing places. Such places mitigate the impact of two contributors to asthma and obesity in children – traffic pollution and sprawl development – by more efficiently using over-sized street space and developable land. Furthermore, greater housing density and safer access to parks, which are both intrinsic characteristics of Garden Neighborhoods and Towns, have also been linked to increased physical activity among children. Moreover, land-use reform and transportation – in service of creating traditional neighborhoods – also increase walking among the elderly who actually prefer having the option to age-in-place. Offering a range of housing options is attractive to both high-income and middle class households as well as affordable for working class and low-income households. Mixed-use buildings have also been shown to help foster entrepreneurial start-up businesses. Although the Garden Region may represent an unattainable ideal for Greater New Haven, the pursuit of that ideal can only make the region a better place. Acknowledgements to Brian Tang and Sandy Johnson for their inspiring ideas on transportation and development in New Haven (see here, and here). Additional credit due to Mark Abraham of DataHaven, who’s Community Index 2013 provided a framework for this proposal.